"Rainfall is somewhere between beautiful and a nuisance," said hydrologist Steven Gorelick, director of the Global Freshwater Initiative at Stanford's Woods Institute for the Environment. "It's not something you immediately drink." So when water supplies come up short, it's often a slow-moving disaster, with effects that accumulate – and linger – for years until rainfall rates seem to return to normal. As a result, Gorelick said, "There's a very short memory of the last drought." Although a shortage of clean drinking water is the most immediate threat to human health, water scarcity can have far-reaching consequences. Diminished flows in rivers and streams can increase concentration of harmful pollutants. Researchers including Rosemary Knight and Scott Fendorf at Stanford's School of Earth, Energy & Environmental Sciences (Stanford Earth) have shown that overtaxed aquifers in some places may become more vulnerable to contamination. When waterways run dry, animals may seek out drinking water from places where people live, increasing the likelihood of contact between humans with wildlife and any disease-carrying insects they host. Drought can also elevate risk of wildfires and dust storms that may lead to irritation of lungs and airways. More directly, when people can't get enough water for sanitation and handwashing, respiratory and gastrointestinal illnesses tend to spread more easily. Food safety can be affected, too: When soils dry out and become compacted, it's more likely that rain will run off the surface and carry contaminants to crops instead of soaking into the ground. 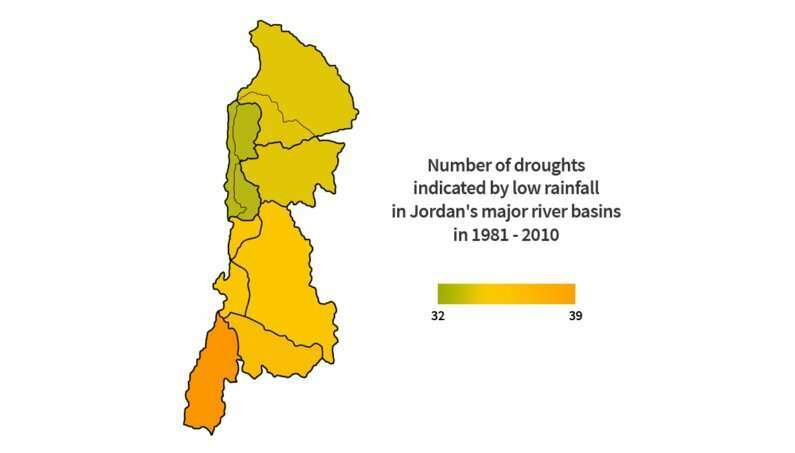 As a way of exploring the future risk of water shortage in a complex environment, Gorelick and his colleagues have made a case study of Jordan, one of the most water-poor nations in the world. Rainfall declines induced by climate change are expected to be compounded by historically limited water resources and ballooning population growth punctuated by influxes of refugees. What's more, flows in one of the nation's key freshwater resources – the Yarmouk-Jordan River – have dwindled as a result of dam building and have also been affected by conflict-driven land-use changes in Syria. The team analyzed data collected through remote sensing and government surveys and developed computer simulations of hydrological processes under different scenarios. The results showed that, barring significant reductions in global greenhouse gas emission rates, rainfall in Jordan will decline by 30 percent and the occurrence of drought will triple by 2100. The team also projected rainfall under a scenario in which emissions begin to decline in the coming decades, roughly in accordance with the goals of the 2015 Paris Climate Agreement. Even under this optimistic scenario, Jordan is likely to experience more frequent and longer droughts of moderate severity by 2100. "We don't know just how bad those impacts of climate change will be or how large the population will grow," said Gorelick, the Cyrus Fisher Tolman Professor at Stanford Earth. 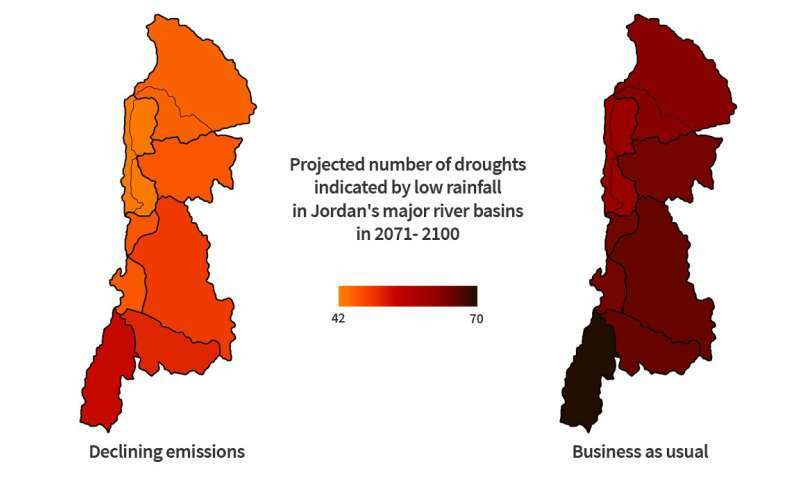 "But it appears to us that Jordan's freshwater future is pretty grim." The group also accounted for conflict and policy scenarios and for factors ranging from corruption to the amount of water needed to preserve the environment. From that the group has been able to highlight the complex web of issues contributing to water scarcity in a warming world, both in Jordan and far beyond. "The basic hydrologic process models are in place," Gorelick said. "The things that are more difficult to predict are society's adaptations to freshwater stress."